Exactly what happens when you integrate your brand investment with demand gen activities? What, if any, is the quantifiable impact of branding on consideration? Can branding cause changes in consideration over time? Does consideration have any effect on the standard KPIs that matter to demand gen marketers, specifically, on things like click through rate? 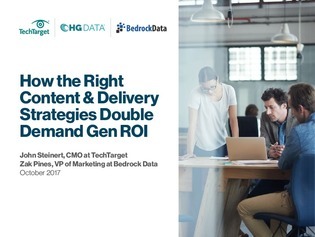 This presentation from TechTarget, HG Data and Bedrock Data details the results of the research and helps you learn how to benchmark against the industry averages for conversion rates at different layers of the funnel.